I have recently rediscovered the joy of shopping for clothes. In an effort to live a more sustainable lifestyle, I had come to li mit my clothes shopping to essentials, well aware of the strain that the fast fashion industry puts on the environment. I had restricted my shopping to ‘essentials’, repeatedly asking myself whether I really did ‘need’ the new dress, trousers or whatever else caught my eye. And that was before considering other ethical angles such as whether those making the clothes were given safe working conditions and a living wage. I’m a ditherer on any day so this new requirement for purchase put all but an end to my shopping. And then I discovered Op Shops (charity Shops, thrift shops, depending where you are in the world). Of course I had always known they were there given that there are at least two on any shopping strip in Melbourne. I’d also donated to them on a regular basis but had rarely, if ever, purchased from one. But, on the recommendation of friends, whose style I respect, I thought I’d give it a go. On my first trip I bought a designer dress in perfect condition for $10, and like a gambler who wins on their first go, I was hooked. Yes, you do have to be discerning. Yes, you do have to look through a few rails of stuff you wouldn’t wear even if paid to. And yes, you may prefer to launder your bargain jumper to ensure a fresh scent before stepping out in it for the first time. But the advantage is guilt-free fun shopping. I buy things because I like them and I don’t worry whether it is excess to requirements. I don’t worry about the carbon footprint or the vast quantity of water consumed in its manufacture. I don’t worry about the cost. And I don’t even worry about the working conditions of whoever wove the fabric or sewed the seams, as buying second-hand cannot influence the market structure. In that haze of first love with my new hobby, I had forgotten that life is never simple. I was chatting on this very topic with my friend Keren Harel-Gordon, who had also recently joined the op-shop-shopping brigade. She remarked on the abundance of op shops in Melbourne compared to her native Israel, and my initial reaction was to assign a green point to Australia. Until she quickly quashed my enthusiasm. 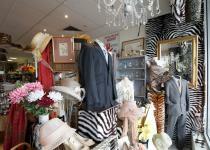 “But why are there so many second-hand shops here, full of so many good quality clothes? Why do people get rid of their clothes so readily?” And the penny dropped. 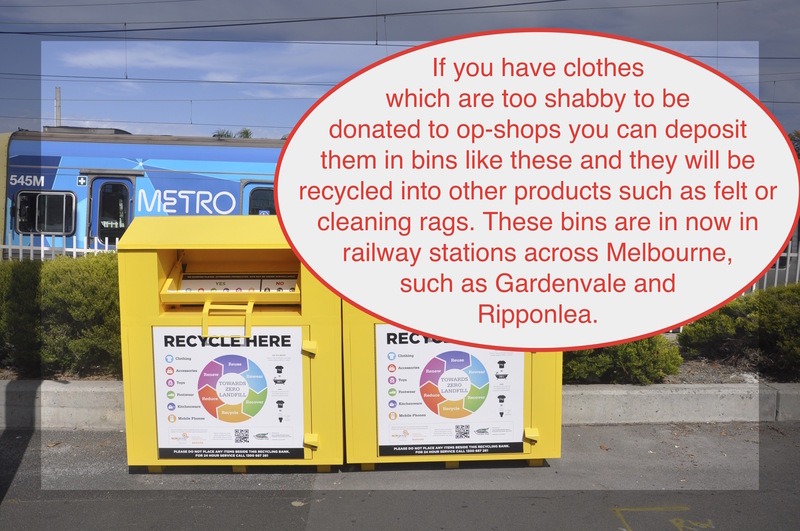 Op shops are part of the problem as well as the solution. If the second-hand market didn’t exist at all then the only option for emptying one’s wardrobe of last season’s clothes, in order to make room for this season’s, would be to throw them in the bin, and even the most frivolous shopper may question the ethics of this. However, that warm fuzzy feeling that arises from doing a good deed, such as donating to charity, becomes part of the motivation to rapidly turnover one’s wardrobe contents. There is a sense that it doesn’t matter if you wear something just once or twice providing you bag them up and hand them over benevolently to a needy cause. Part of me hesitates to write this as life is complex and op shops serve multiple functions, and have a valuable place in society. Many of the clothes belong to those who genuinely have no further need for them, as they have outgrown them or moved on to the world-to-come. I also have no in intention of giving up my new found hobby. I am, though, grateful to Keren for drawing my attention to this, and will now think twice if I find myself bagging up old clothes for donating a little too frequently. I use the term “need” rather loosely knowing that with all the best frugality in the world ‘essential’ in Melbourne isn’t comparable to ‘essential’ in places such as Afghanistan or Burkina Faso. Previous Post Are the COALition fossil fools?